I wonder if the “German” ancestors were only German in the political sense, but ethnically Scandinavian. It’s not a long distance from Denmark to Hesse, perhaps some of them emigrated a few generations back. And, how do I put this delicately, the ancestry chart only shows who they were married to, not necessarily who they had children with. 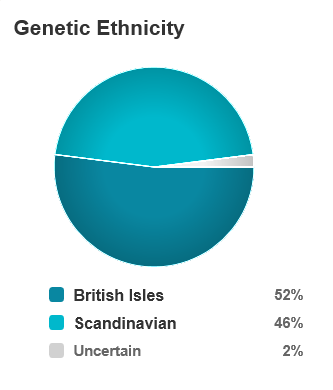 The odd thing is that the Scandinavian percentage is so high – almost half my DNA – without any known Scandinavians in the family tree in the last few centuries. The two most likely possibilities – from the statistical perspective – are that there’s one very recent Scandinavian or that there are lots of more distant Scandinavians on many branches of the tree. And yet we have no family tree info to suggest that any recent ancestor was Scandinavian, or that lots of branches had Scandinavians in the past. A single distant ancestor’s DNA could have cascaded down the generations, always winning out in the random shuffle-and-deal of genetic inheritance, but that’s unlikely – possible, but unlikely.